Autumn is the time for the wabi-sabi beauty of changing seasons. This encourages us to embrace the imperfect and the passing of prime. Go wild with foraged branches, bark, pods, and leaves. Big, floppy mature blooms arranged in the style of lush still life paintings are great not only for centerpieces, but garlands and bouquets as well. 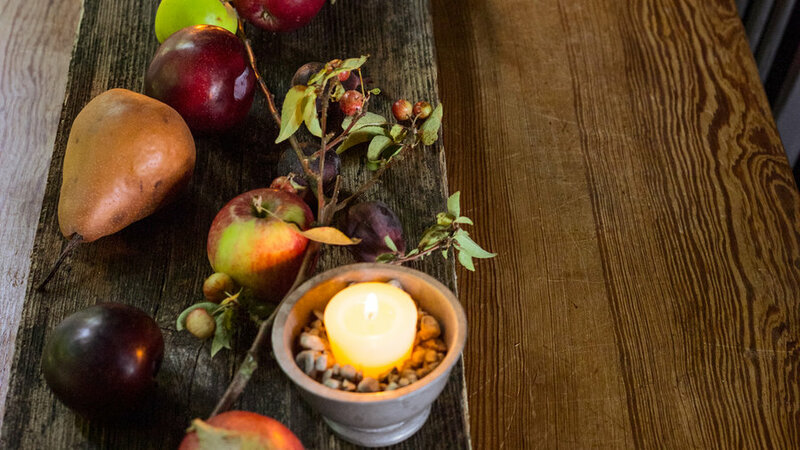 Edibles, from ripe fruit to herbs, bring harvest magic indoors. 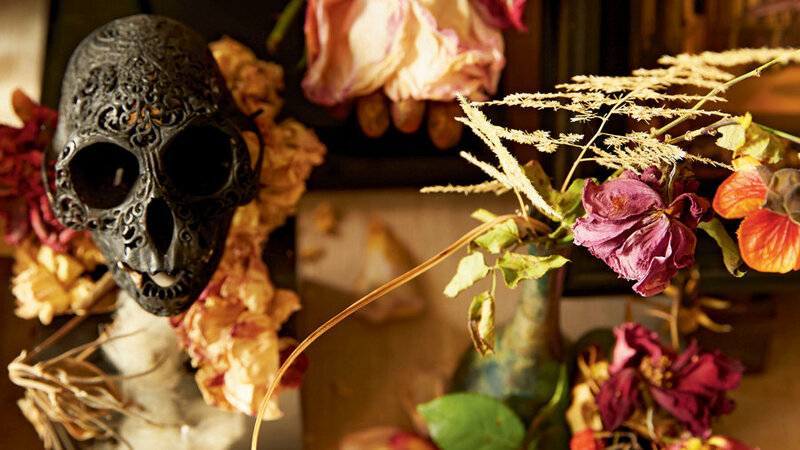 Floral artists are going local and seasonal inspired by changes in nature and unexpected beauty. 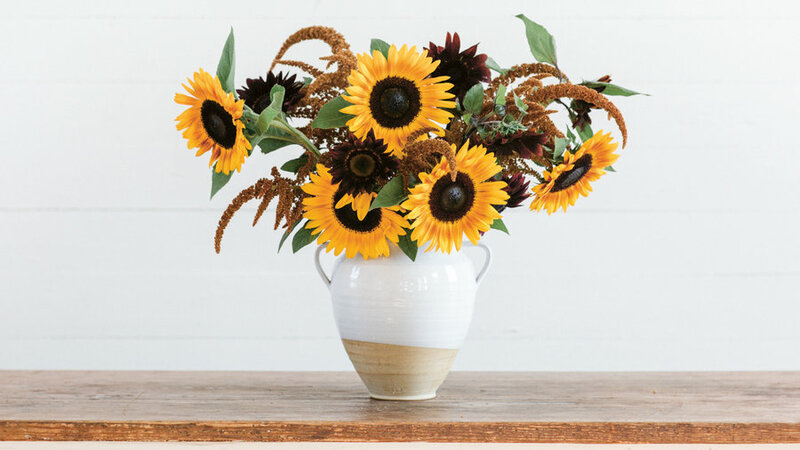 A rustic clay vase and a bunch of sunflowers in their prime are the basis of a bold arrangement. Vincent van Gogh’s famous Sunflowers painting inspired this bouquet, by of . She advises, “No special technique is required. 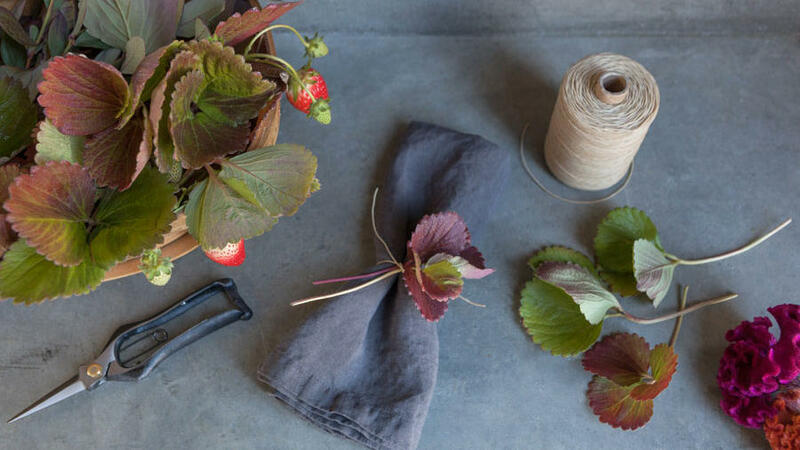 You just need an arm­load of seasonal bounty to arrange in a hand-thrown pottery vessel.” Excerpted from Floret Farm’s Cut Flower Garden, Chronicle Books 2017. When using fruit along with herbs, vines, and flowers, Louesa Roebuck, co-author of , recommends using seasonal, local fruits. Avoid fruit that is perfect and shiny. Instead, scour the farmers' market for seasonal fruits that might be misshapen and have wormholes. Include stems and leaves and let them droop. Reprinted with permission from Foraged Flora by Louesa Roebuck and Sarah Lonsdale, copyright 2016. Published by Ten Speed Press, a division of Penguin Random House, Inc. Images © 2016 by Laurie Frankel. 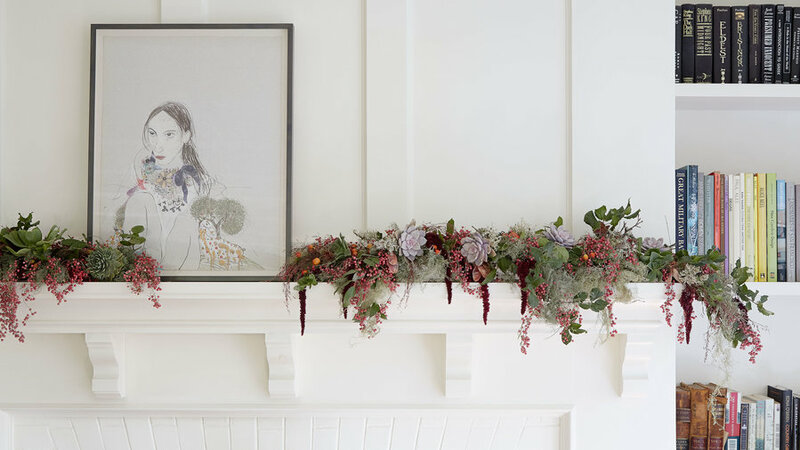 This garland can run along a mantel or down the center of a table. Mixing moss-covered branches with lichen, cut garden flowers, rose hips, and succulents creates a sense of rich, seasonal beauty. Use only lichen and branches from the ground, not live on trees, as these can be slow growing. From , copyright 2016 by Caitlin Atkinson. All rights reserved. Published by Timber Press, Portland, OR. Used by permission of the publisher. Consider using small logs as the “vase” and moss as the foliage. Mushrooms, leaves and flowers add texture in this Pacific Northwest-inspired centerpiece by . 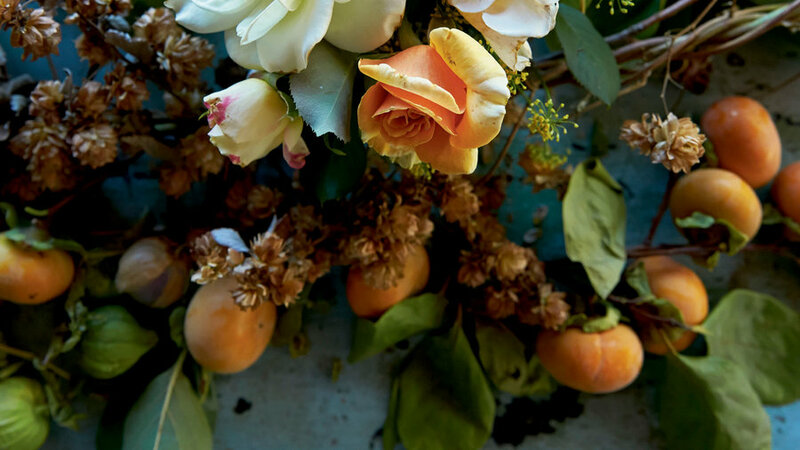 She has a Portland based flower studio where she teaches the art of being inspired by local beauty. 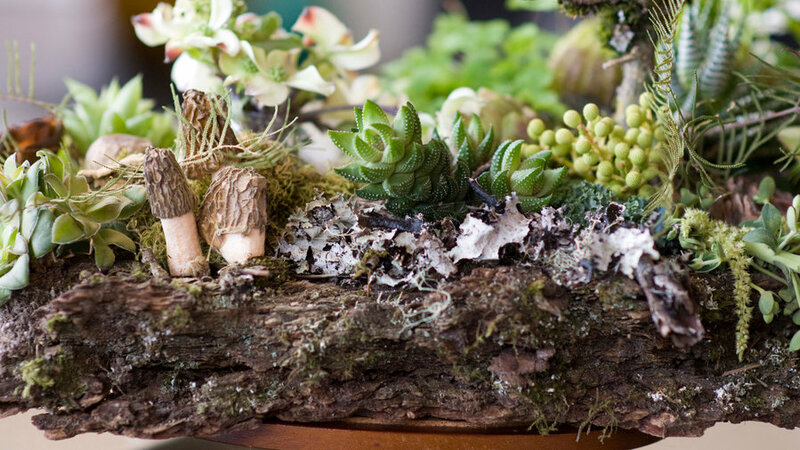 Her tips for this tableau are to use cold glue to get moss onto the log, and to then attach succulents, mushrooms, pods, and flowers to the moss (they won’t glue to the bark). You can also fasten small cups filled with floral foam into the crevices of the log for your succulents and small ferns. 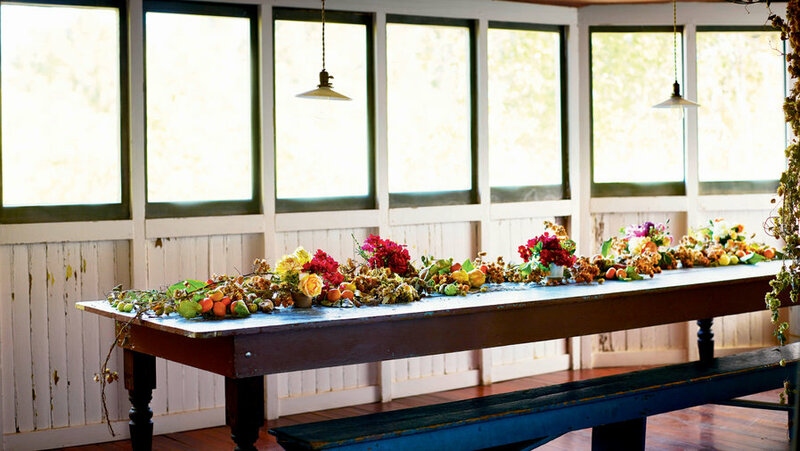 According to , having a series of small arrangements flowing down the center of a table can be “more symbiotic with the food” than one large arrangement. She advises that you find vases with wide mouths. She also considers the dining experience for her guests; she keeps the arrangements low so guests aren’t blocked from seeing each other. Reprinted with permission from by Louesa Roebuck and Sarah Lonsdale, copyright 2016. Published by Ten Speed Press, a division of Penguin Random House, Inc. When autumn arrives, many gardeners cut and dry herbs for the winter. 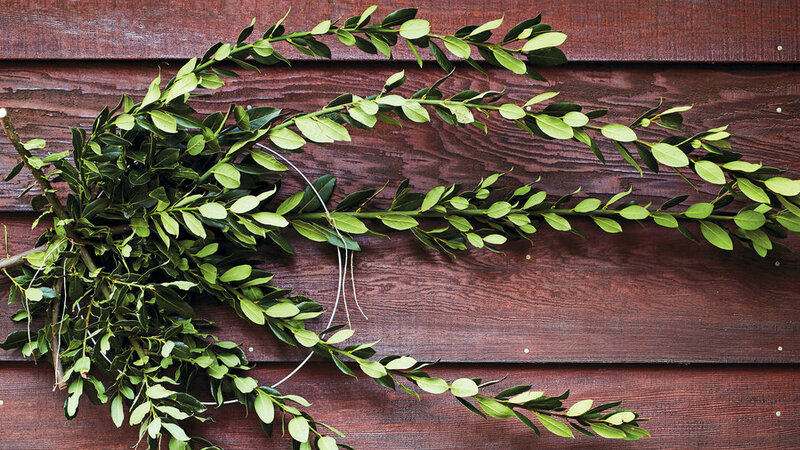 In this sage wreath from , garden designers Stefani Bittner and Alethea Harampolis suggest using prunings from bay laurel and create a contemporary wreath that has more organically flowing branches to keep in your kitchen. They recommend you start with a 14-inch circular wire wreath frame and use twine to attach the longest, straightest branch so that it bisects the frame. Then tie the smaller ones on, pointing in the same direction. When you want a change, put the leaves in a jar and use them as herbs. Photo reprinted with permission from Harvest by Stefani Bittner and Alethea Harampolis, © 2017, published by Ten Speed Press, an imprint of Penguin Random House LLC. Photographs © 2017 by David Fenton. Ariella Chezar, author of , recommends starting your arrangement by deciding on your color scheme. Choose the mood you want to set, and then decide whether you want analogous or contrasting colors. From there, build a variety of tones, textures, and shapes. 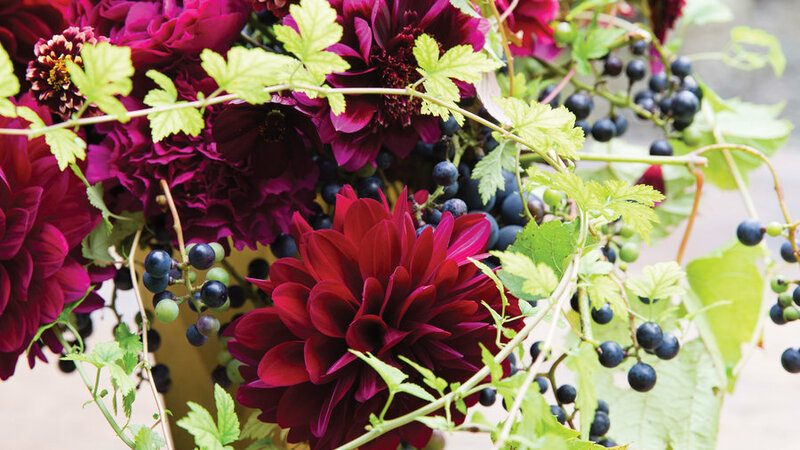 Dahlias are gorgeous, deep-hued flowers that bloom into autumn. Here, Chezar has paired them with clusters of ripe grapes. The leaves of the grapes have been cut off, the vines cascade over the vase, creating a harmony to the dahlias' melody. Reprinted with permission from The Flower Workshop by Ariella Chezar with Julie Michaels, ©2016, published by Ten Speed Press, an imprint of Penguin Random House LLC. Photographs ©2016 by Erin Kunkel. While lush is lovely, sometimes a simple leaf turning russet, like this strawberry leaf, is a beautiful reminder of the outdoors. Moreover, it creates a transition from table setting to meal. Design courtesy of the Healdsburg Shed. This arrangement from calls for marigolds, safflower, chrysanthemums, and bittersweet branches. Trim down your flowers to just the heads. 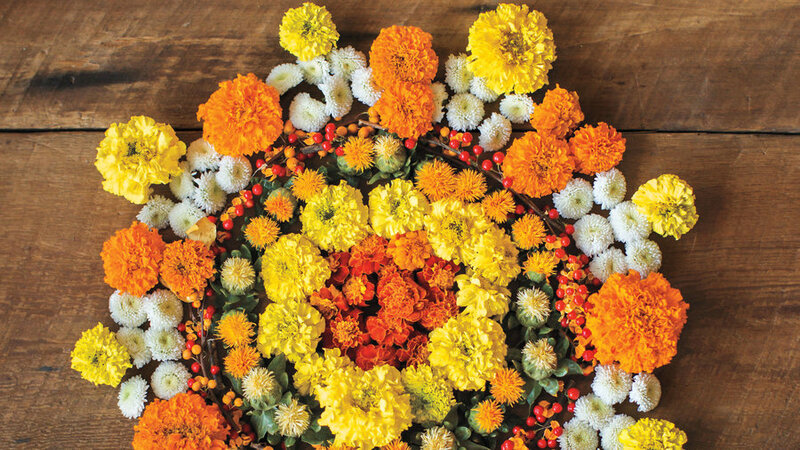 Start with a small circle of marigolds in the center and continue to build around it. Cut the bittersweet branches to size. Excerpted from Branches & Blooms by Alethea Harampolis and Jill Rizzo (Artisan Books). Copyright 2017. Autumn is a time when days grow shorter and we are often reminded of the passing of time and our own mortality. Floral bouquets are ephemeral and often short-lived. Letting flowers petals fade, wilt, drop, and die has its own brand of beauty. Reprinted with permission from by Louesa Roebuck and Sarah Lonsdale, copyright 2016. Published by Ten Speed Press, a division of Penguin Random House, Inc.